These two altarpiece wings would presumably have originally flanked a central compartment depicting The Adoration of the Magi. Comparable wings are to be found in the triptych formerly in the Church of Santiago, Teruel (G. Marlier, La Renaissance Flamande, Pierre Coeck D'Alost, 1966, pp. 138-41, nos. 67 and 68, illustrated) and in that sold, Christie's, Amsterdam, 8 November 1999, lot 114, illustrated. As noted by Marlier, op. 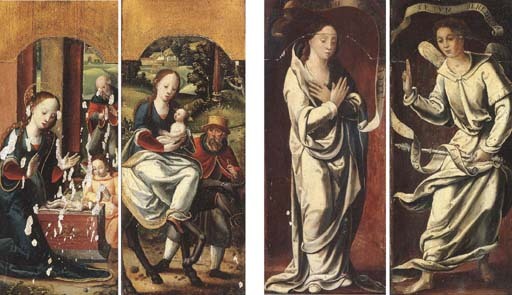 cit., Coecke van Aelst relied heavily upon the oeuvre of his father-in-law, Jan van Doornicke, for the compositions of his triptychs. That of the present lot, for example, follows the latter's altarpiece in the Barcilon collection, Paris (ibid., p. 137, no. 67, illustrated).